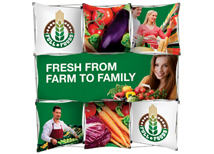 Geometrix 3-D pop up displays are unique display systems that are easy to assemble, yet stand out in a crowd. 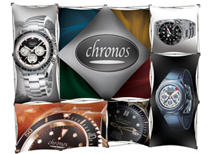 The graphic "skins" can be made in many different shapes and sizes to create a unique and custom trade show booth that will stand out without depleting your budget. 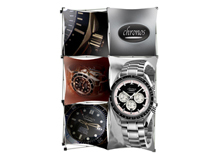 These trade show displays are very similar to the Xpressions brand displays but are available at a much lower price point. Every Geometrix display can be made into a custom configuration. 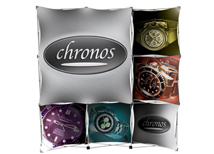 You can contact us for pricing on any display configuration! 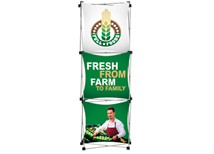 Geometrix pop up displays are the one of the affordable options. Although Xpressions offers a few more frame choices, the Geometrix is much more affordable. 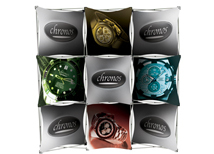 All the skins are made from dye sub fabric and the frame is aluminum with a limited lifetime warranty. Most of the kits include soft cases to protect the display during shipping. The Geometrix can be customized so if there is a certain configuration you want, we can make it. 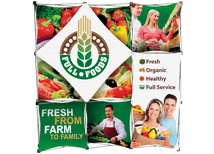 We offer a lot of different trade show display options for the Geometrix including trade show accessories, hanging banners, and outdoor banner stands!